Liftoff for New Mexico Rocket Festival! 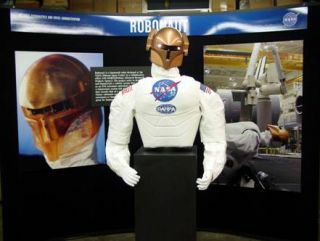 NASA's Robonaut is making an appearance among the many exhibits at the Wirefly X Prize Cup '07 and Holloman Air and Space Expo. LAS CRUCES, NM – There's somethingin the air here. And that's the result of a partnership between the X PrizeFoundation and the State of New Mexico to create nothing less than the world'sfirst true rocket festival. TheX Prize Cup and Holloman Air Force Base in neighboring Alamogordo here havejoined forces to produce a thrill-filled Air& Space Expo extravaganza, to be held this coming weekend, October27-28. Thisfirst ever Air & Space Expo will give spectators a unique view of flight –from historical aircraft to the future of spaceflight, said Bretton Alexander,Executive Director of Space Prizes and the Wirefly X Prize Cup in Washington,D.C. "Peoplewill be able to walk from one end of the history of flight to the other, andimagine what might come next and how they can be a part of it," Alexandersaid. Abottom line for showcasing an array of vehicles that can take to the sky: Createthe first-ever "live" air & space expo with both launch andflying activities throughout each day. The49th Fighter Wing is the host wing at HollomanAir Force Base and supports national security objectives with, for example,mission-ready F-117A Nighthawk stealth fighters. "Itwill be a two-day air and space show like never before," said BrigadierGeneral David Goldfein, 49th Fighter Wing commander. "We are going to haveflying demonstrations and static displays of all the aircraft in the Air Forceinventory," he said, intermixed with commercial space companies competingin the X Prize competition. Clearly,one milestone-making event is the Northrop Grumman LunarLander Challenge. Indeed, this signature event speaks to the mantra behindthe Wirefly X Prize Cup: Revolution Through Competition. Thelunar lander competition is running hot and heavy, given $2 million in prizemoney at stake for the teams that can launch their lunar landers into the skyand return them safely to a simulated lunar surface within the allotted time. "Weare excited about the chances of a team winning prize money in the NorthropGrumman Lunar Lander Challenge this year," Alexander told SPACE.com. "Watching the teams compete is an edge-of-the-seat thrill ? anything canhappen!" Also,there's another aspect of this year's Challenge that's very new and novel. "There is a logical continuum between the Northrop Grumman Lunar LanderChallenge and the Google Lunar X Prize," said Will Pomerantz, director of SpaceProjects for the X Prize Foundation. TheGoogle Lunar X Prize is a recently announced robotic race to the Moon to win a$30 million prize purse. Private companies from around the world will competeto land a privately funded robotic rover on the Moon that is capable ofcompleting several mission objectives, including roaming the lunar surface fora distance, as well as send back to Earth video, images and data. "Sofar, well over 200 people have requested registration material from us,"on the Google Lunar X Prize, Pomerantz told SPACE.com. Boththis Saturday and Sunday – October 27 and 28th – the WireflyX Prize Cup and Holloman Air and Space Expo will fill the skies and imagination,from the 8:00 a.m. gate opening at Holloman Air Force Base to 5:00 p.m. closingtime. Thefree and open-to-the-public spectacular will feature seven hours each day oflive rocket launches, air show performances, as well as the Northrop GrummanLunar Lander Challenge vehicle competition. Ground and static displays ofrockets, NASA show-and-tell exhibits, robots and planes, including military andwarbird aircraft, are part of the revelry. Onespecial event among many is the display of finalist ideas from teams of highschool students from all over the United States, all focused on winning the2007 Pete Conrad Spirit of Innovation Award. The proposed ideas wouldaccelerate the personal spaceflight industry. Theten finalist ideas range from reducing the shock vibration of rockets to a beltthat would allow people to play sports in micro-gravity. Winners will be chosenby popular vote, and announced at the closing ceremonies on Sunday, October 28,at noon. The first place team will receive a $5,000 grant, followed by $2,500for second place and $1,500 for third. Theaward itself is a large, bronze rocket ship trophy, created especially for thiscompetition by Erik Lindbergh, an artist, aviator and grandson of famed aviatorCharles Lindbergh. Whatelse can you expect to see at the Holloman Air & Space Expo? Ifyou need to give your neck a rest from watching the sky, take a walk throughnearly 30 acres – that's right, 30 acres – of ground displays featuring 100exhibitors, NASA show-and-tell, rockets, rovers and robots, military aircraft,flightline chalets, souvenir vendors and food/beverage concessionaires. Bythe way, while in Alamogordo, put on your to-do list a visit to a very specialmuseum nearby – the New Mexico Museum of Space History. Check this museum outand its incredible array of exhibits, IMAX presentations, plus indoor andoutdoor rocket and space hardware on display. Foryou last-minute procrastinators out there, if you are flying from a differentstate, it is best to arrive at the El Paso Airport in El Paso, Texas. This airport is fairly small and easy to maneuver. The airport is aboutone-and-a-half hours from the city of Alamogordo. HollomanAir Force Base is located off the 70 freeway. From El Paso – or from the south –just take US 54 to US 70 West, then exit at Holloman Air Force Base. From the west,follow US 70 and exit at Holloman Air Force Base, and from the east, follow US70 and exit at Holloman Air Force Base. Pleaseuse Holloman's main gate entrance off of Highway 70. Officialsat the X Prize Cup have posted notice that the weather is typically in the 70'sduring the day and 40's to 50's in the evening. They recommend that you leaveyour hat on – that is, protect yourself from the sun. Don't forget to bringcomfortable walking shoes, sunglasses, sunscreen and a camera, and make sureyou drink plenty of water.